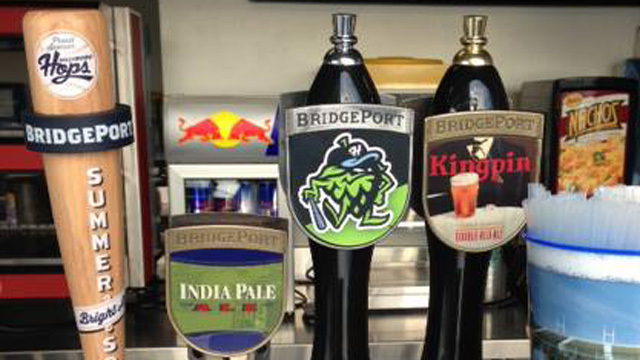 The Bridgeport Brewing Company is very prominent among the taps found around Hillsboro Ballpark. Baseball and beer go together like, well, baseball and beer. This symbiotic sports-beverage relationship is unparalleled in the annals of American culture. It goes without saying that all 160 Minor League Baseball teams offer beer on tap for the (not always) discerning adult-beverage consumers in attendance. But in recent years, many clubs have gone beyond simply offering mass-produced domestic mainstays, partnering with local breweries in order to offer their own exclusive brand of team beer. This edition of Farm's Almanac provides a comprehensive (but perhaps not exhaustive) overview of the team-branded ales, lagers and IPAs that can be found within the world of Minor League Baseball. Chin Music, an amber lager that hit the Richmond-area market last month, is described as "a smooth, easy-drinking lager" that uses German Tettnang hops to create a "modest bitterness." In addition to being an esteemed podcast co-host, Flying Squirrels broadcaster Jay Burnham is a self-professed beerhound who gives Richmond Brewery tours in his spare time. As such, he was more than happy to spread the Chin Music gospel. "The cool thing about this is our collaboration with and relationship to the brewery, Center of the Universe Brewing (named after the town motto of Ashland, Va., just north of Richmond)," wrote Burnham in an email. "The owner [of Center of the Universe] is former Major League pitcher Chris Ray, who actually played for the Squirrels' parent club [the San Francisco Giants], and his brother, Phil. Chris developed a love of craft beer in his travels in baseball and started brewing test batches tinkering in the business. He then developed the plan to open a brewery and hired the founder of the Virginia Craft Brewers Guild to be their head brewer when they opened up shop about 16 months ago. They also do an annual Homefront IPA that is brewed on Louisville Slugger bats with ALL of the proceeds going to military families." A so-called "session" beer, Center of the Universe has a 4.5% ABV (alcohol by volume) and comes in at 24 on the 0-100 International Bitterness Unit (IBU) scale. Given that the team is named after a key beer-making ingredient, it only follows that the Hops would go out of their way to offer a robust beer selection at the ballpark. General manager K.L. Wombacher reports that the Hillsboro market has a strong affinity for craft beers, which outsold Miller and Coors at a 10-to-one clip during the Hops' inaugural 2013 season. At the forefront of this craft craze is the Bridgeport Brewing Company's Long Ball Ale, a team-branded beer that outsold all other stadium beers by a six-to-one margin. Boasting a 5% ABV and 28 IBUs, Long Ball Ale is a triple-hopped summertime brew possessing a "subtle biscuit-like malt flavor." When the beer was unveiled last June, Bridgeport brewmaster Jeff Edgerton remarked that "One of my favorite characteristics about this beer is the slight Meyer lemon finish that you get after dry hopping with Meridians, a fairly limited hop in our state." The popularity of Long Ball Ale has prompted Bridgeport Brewing to make the beer available outside of the ballpark; Wombacher reports that 22-ounce bottles will available at local grocery stores beginning in June. The Hillsboro Hops are adding a hop garden to their ballpark this season, a most apropos addition considering their name. But the first team to undertake this endeavor was the Myrtle Beach Pelicans, who compete in a region not as readily associated with craft brewing. The Pelicans' "Hops Heaven" garden, the brainchild of facility operations manager and avid home brewer Mike Snow, was planted prior to the 2013 season, and now the team is reaping the fruits of its labor. Partnering with New South Brewing Company, the team has used its own ballpark hops to create "Pelicans Summer Tide," a citrus-infused white pale ale. For every keg sold, the Pelicans donate $10 to local Mercy Care Hospice as part of their "Hops for Hospice" charity program. Indians Lager, a seasonal lager, debuted in 2010 and is available at Victory Field as well as throughout the Indianapolis area. Featuring a 5.4% ABV and a 24 IBUs, Indians Lager is a "Vienna style" offering described as featuring a "balanced malt flavor that finishes crisp, thanks to the addition of German Noble hops." The eye-catching, borderline hallucinogenic artwork featured on the 16 ounce cans is an added bonus. This season the Charlotte Knights are playing in a brand-new downtown ballpark, and to celebrate, the team has partnered with Charlotte's NoDa Brewing company to create "A Knight's Ale." This "sessionable" IPA, comprised of four kinds of hops, boasts a 5.9% ABV and is only available at BB&T Ballpark and the NoDa Brewery. BREAKING NEWS! Just before this article went to "press," an email landed in my inbox touting the RiverDogs' first-ever ballpark brew. Like Reese Witherspoon on a safari, "The Original" is described as "an adventurous blonde." It debuted Thursday at Charleston's Joseph P. Riley Ballpark, poured from a tap featuring a baseball bat handle. "The Original is a light and balanced beer without dark roots or bitterness," report the RiverDogs. "It is sunlight-dried straw in color and features a lightly malty palate ... with a clean crisp tangerine aroma and a neat finish along with a slight hint of lemongrass." But does it pair well with frogs legs and sushi dogs? The Omaha Storm Chasers actually compete in nearby Papillion, and the Nebraska Brewing Company is headquartered in that town as well. The two entities collaborated in 2013 to bring Ale Storm to the masses, which the team describes as a "thirst-quenching beer that balances the delicate sweetness of Pilsner malt and lemony/spicy notes of Sterling hops." Ale Storm has an ABV of 5.1% and 14 IBUs, resulting in a lighter color than most (if not all) of the beers contained within this piece. First introduced in 2008, Iowa Oaks Ale pays homage to the I-Cubs' original "Oaks" moniker, which itself was an homage to the team's then-status as an Oakland affiliate. Got that? "[Iowa Oaks Ale] is a refreshing summer beer using corn as a fermentable -- a first for Court Avenue Restaurant Brewing Company," said Mike Gauthier, head brewer for Court Avenue Brewing Company, when the beer was first released. "We thought it appropriate since it is a beer brewed in Iowa to celebrate the Iowa Cubs." This long-running offering from Rohrbach Brewing uses caramel malts, resulting in a reddish color that of course pairs well with a Rochester Red Wings game. At a modest 4.5% ABV, Red Wing Red Ale is designed to be enjoyed from first pitch to last call.